Cynthia S. Sherry, MD, FACR, chairs the department of radiology at Presbyterian Hospital in Dallas. In June, she was elected president of the American College of Physician Executives. Sherry recently discussed financial issues facing radiology physician executives with Radiology Today. Radiology Today (RT): What do you see as the No. 1 financial issue facing radiologists today? Sherry: The biggest problem is decreased reimbursement rates. That, coupled with difficulties in billing, collecting, and payment delays, reduces revenue. That translates into everyday practice, pressuring radiologists to increase their productivity to boost their revenues. Radiologists are forced to interpret more studies within a given time frame, but the complexity of cases and the number of images associated with each case is growing rapidly. That makes the burden of interpreting each case that much more difficult. On top of that, recent advances like new PACS with multiple sites to read from complicate everyday practice. An increase in productivity is not just a simple thing to do. RT: What are some of the other top financial issues that you see? Sherry: Decreasing revenues is a short-term financial problem, but if you think of a bigger picture and look further down the road, there are some other problems that radiologists face that could affect finances. Those problems are related to events such as turf erosion, nighthawking, trends toward larger groups, and the potential for corporatization. Another issue is the growing demand for specialization in radiologic expertise and the demise of the generalist. Some of these issues have both pluses and minuses, but they’re still issues. RT: What role does turf erosion play in financial issues facing radiologists? Sherry: The June 2008 Government Accountability Office (GAO) report on Medicare Part B imaging services identifies self-referrals as a significant driver for increased medical imaging utilization and the associated healthcare costs. Turf erosion is, in large part, related physicians other than radiologists who are interested in boosting their own revenues through ancillary services such as medical imaging. As a result, we face the problem of self-referral. It is a bigger problem for radiologists in the longer term than the immediate issue of declining reimbursement. Finances are at the root of the turf erosion that we’re seeing. RT: How has the Deficit Reduction Act (DRA) of 2005 financially impacted radiology? Sherry: Radiologic and medical imaging accounts for a large part of the healthcare dollar, so much so that the government saw the need to cut back on imaging payments. With the DRA, the government carved out about $1.8 billion. According to the GAO, that was about three times more than their estimate. These cuts disproportionately impacted radiologists. In addition, the DRA has resulted in this tremendous negative effect on reimbursement for the technical component of imaging, for outpatient and physician-referred imaging procedures. The technical component is now paid by the lesser of the fee schedules, which is the OPPS [outpatient prospective payment system] vs. the RBRVS [Resource-Based Relative Value Scale]. RBRVS is historically based on actual costs of providing the service, whereas OPPS is based upon payments, not the cost of providing the service. It’s a payment system that’s not rooted in any logic or basis in fact. There’s been a downstream effect resulting in reduced profits to imaging centers, and many centers have been driven out of business. I don’t know if that’s a good thing or a bad thing, but it’s certainly a consequence of the DRA. RT: What are your major concerns regarding Medicare reimbursements for radiology services? Sherry: Aside from the concern radiologists have about low reimbursements, the more important concern is about lingering problems with the annual recalculation of conversion factors, plus the requirement for budget neutrality that CMS [the Centers for Medicare & Medicaid Services] has for the pay-as-you-go provisions of Medicare funding. Therefore, the concern is that reimbursement rates will ultimately be based on balancing the budget rather than actual costs incurred by providing the service. This is important. It can lead to access problems because physicians will choose to opt out of Medicare. We could be staring down the barrel at a deeper dearth of physicians willing to find it financially reasonable to care for Medicare patients. It all comes back to the reimbursement issue. RT: How will reimbursement changes financially affect radiologists? Sherry: Ultimately, what happens is that the government or other payers take money out of radiology. What we end up with are fewer dollars to upgrade or replace our major equipment. As you know, the major equipment we use for medical imaging is very expensive. Radiologists routinely face large capital requirements to upgrade and replace major equipment. If we can’t make these large equipment replacements, patients will not have access to state-of-the-art equipment and advanced technology. RT: How can stakeholders help solve financial issues in radiology? Sherry: The government, the American College of Radiology (ACR), and the American College of Cardiology identify quality-based initiatives to curtail some utilization of medical imaging that’s done just for financial purposes. There are efforts that would implement mandatory accreditation of imaging centers and certification of equipment and providers and personnel in order to reduce inappropriate utilization. Implementing appropriateness criteria would also go a long way toward making sure that the right tests are ordered in the first place. RT: What good news is there for radiologists concerning the current legislative and regulatory process? Sherry: At the state level, there have been some positive results. For instance, some states have enacted prompt-pay laws. Such laws have brought some order and predictability to radiologists’ relationships with payers regarding things like filing claims, establishing appeal deadlines, and managing overpayment and refund requests. These are all very complicated problems for radiologists. Some of these state laws have improved that situation a little bit. RT: What is the potential influence of other government-related issues, such as the GAO report on Medicare Part B imaging, on radiology? Sherry: The regulations the GAO report propose that require site, equipment, and physician accreditation and credentialing could be very powerful and beneficial for patients and for radiology. They hold the promise for safe imaging for patients. That means conducting the right tests for the right reasons the right way the first time and having them done by qualified people on well-maintained equipment. While the government’s goal may actually be to save money, things like the GAO report are having some potentially powerful and beneficial effects for imaging patients and their doctors, which is more important. 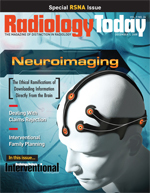 RT: How can radiologists influence legislation and regulations? Sherry: Radiologists, and the imaging field in general, are very fortunate that we have organizations like RBMA [the Radiology Business Management Association] and ACR. They’re strong organizations that have successfully worked to keep their memberships informed and educated. ACR has been a powerful spokesperson in Washington, speaking in support of preserving quality in imaging, credentialing and appropriateness, and access for patients. Because of the efforts of organizations like these, there is potential for future legislation that could eliminate or replace physician safeguards on lease arrangements, self-referrals, and inappropriate utilization of imaging. RT: From where is the capital for the maintenance and replacement of imaging equipment going to come? Sherry: The doomsday scenario regarding the impact of the DRA is that if we don’t change the way things are going right now, there won’t be any capital for upgrades and replacement equipment. The worst possible scenario would mean that patients aren’t going to benefit from the advanced technology that we have available today. If you take all of the profit out of imaging, there is no money left to upgrade or replace old equipment with new technology. It is imperative that we arrest the downward spiral before we’re too far gone and the specialty of medical imaging is harmed severely. If we keep on the direction we’re heading right now, there just won’t be sufficient cash flow and/or borrowing based on ability for repayment. RT: How else can radiologists be affected by new technology developments? Sherry: Radiologists as a generalization are technophiles. We love all the technological advancements associated with our field and typically embrace them as they become available. Many recent advancements have led to huge imaging data sets that are often cumbersome, complicated, or time consuming for radiologists to view and interpret. The diagnostic capabilities have improved, but data management techniques have lagged. This places a significant burden on the time and productivity of radiologists, not only in producing their interpretation reports but also in coming up to speed on the learning curve to adopt new technology. From the financial perspective, lost time is lost revenue. Time is money. Also, at times, the vendors and demands from the market push new technological advances into prime time before they’re ready. When this occurs, the promised efficiency or the associated improved performance is not always realized, and expectations aren’t always met. Then frustration builds and we’re all disappointed. A good example of this might be early voice recognition products. They hit the market and seemed like a good way that hospitals could eliminate transcription costs. However, when they first implemented voice recognition, maybe the products weren’t ready for prime time. Radiologists grew frustrated, productivity declined, and we ended up with one of those scenarios where you ask, “Do you want to throw the baby out with the bathwater?” The technology just wasn’t quite ready. Along these same lines, historically, we don’t generate CPT codes at the same pace as we generate new procedures or new technology. Therefore, technology is out there and available, but nobody is willing to pay for it. It’s still considered experimental until a CPT code is attached to it. RT: What impact has the current tight credit market had on radiology practices? Sherry: We’re no different than any other business in the United States, or globally for that matter. We have to watch and manage our cash flow expectantly. We see that financing will be harder to obtain, that interest rates will likely be higher, and that loan covenants will be more restrictive. RT: What financial challenges are you finding with your hospital partners? Sherry: Hospitals, like everyone else, are affected by our faltering economy. They’re affected by changes in the financial class of their patients. They have been affected by joint venturing with physicians. They’re affected by the growth of physician-owned and specialty-type hospitals. But, from the radiologists’ perspective, hospitals are hearing more demands from nonradiologist clinicians for imaging privileges. Obviously, that challenges the tradition of the exclusive contracts that radiologists have had with hospitals for many years now. On the other hand, hospitals are struggling with the need for high-capital expenditures to equip their imaging departments adequately and competitively. They struggle with the reimbursement issues in their DRG [diagnosis-related group] world of reimbursement. Now is the time when it would be smart for hospitals to join forces with radiologists to protect medical imaging’s future. Radiologists could help hospitals select and appropriately operate new imaging equipment efficiently and help reduce the duplication of this costly equipment in multiple departments. Also, hospitals are seeing consolidation of payers having an effect on them and radiologists. Physicians and hospital executives are seeing the payers consolidate into three, four, or five large payers rather than numerous small ones. That means that collecting payments from insurers can become complicated and expensive. There are more billing disputes and protracted payment delays. Both doctors and hospitals have very little negotiating power and few options when these large insurance companies reject our bills. RT: What is the financial impact of manpower issues in radiology? Sherry: One of the main problems is that there is a shortage of radiologists, although the shortage may not be as acute as it was in previous years. We’re also seeing an increasing demand for radiologist specialists’ interpretations. Orthopedists want orthopedic radiologists, surgeons want neuroradiologists, pediatricians want pediatric radiologists, and the list goes on. During the time of an overall shortage, this demand for specialty interpretations becomes a big burden in all areas but especially in rural locations. It’s difficult, if not impossible, for small and rural facilities to provide a full spectrum of radiology subspecialty expertise 24/7/365. Outsourcing, meaning nighthawks and dayhawks, is gaining traction. While these outsourcing options might appear attractive, the devil is in the details. Such arrangements separate the interpretation portion of radiology from the valuable contributions of local radiologists. Those contributions include medical oversight, protocol building, and consultations with colleagues and trusted members of the healthcare team. Nighthawks and dayhawks might be good short-term solutions, but, in the long run, they undermine the contribution that radiology makes to the healthcare team. RT: Can radiologist assistants and radiologist practitioner assistants play a role in easing manpower issues? Sherry: Yes, but only if the payment and reimbursement issues, the training and supervision issues, and the scope-of-practice issues are worked out. This would occur mostly at the state level. RT: What type of management or leadership training do you believe is necessary for radiologists to effectively manage their practices? Sherry: Radiologists are in big business. With that, their lack of formal business and leadership training is a problem, leaving them like guppies swimming with sharks. Medical imaging is at the center stage of modern medical practice, especially in the acute care setting. Imaging commands a rapidly growing portion of the national healthcare dollar. Radiologists are uniquely suited to lead the way to technologically advanced and cost-effective imaging that could maximize the benefits of imaging for patient care. With all these things in mind, radiologists would clearly benefit from a full compliment of management and business leadership training in such areas as receivables, lost revenues, contracting, strategic decision making, reaching consensus, strategic partners, negotiating, and conflict resolution. RT: What future financial issues should radiologists prepare for? Sherry: Radiologists were really impacted by the DRA. With any luck, when RBRVS is revisited with the goal of redistributing physician payments, hopefully the government is going to realize that radiologists have already paid in big bucks. I think that’s probably a pie in the sky, but I’m hoping that radiology will be spared a big hit. Future financial issues revolve predominantly around self-referrals, the significant driver of inappropriate utilization of medical imaging, and its associated costs. The quality-based initiatives we’ve already discussed are at the root of the financial issues we’ll be dealing with in the future. Also, if all physician offices, primarily nonradiology physician offices that provide advanced imaging studies, are required to register as IDTF [independent diagnostic testing facilities], that would improve transparency and allow appropriate regulation of finances.